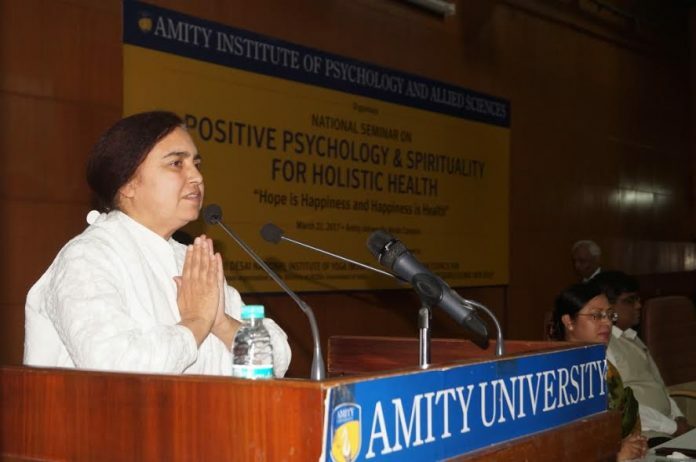 Noida: Amity Institute of Psychology and Allied Sciences, in association with Morarji Desai National Institute of Yoga (MDNIY), Ministry of Ayush, organized National Seminar on “Positive Psychology and Spirituality for Holistic Health” at University Campus, Sector-125, Noida. Welcoming the distinguished gathering, Prof. (Dr.) Abha Singh- Director, Amity Institute of Psychology and Allied Sciences stressed that hope is happiness and happiness is health. Referring to World Happiness Report 2017 released at UN during International Day of Happiness celebrations, Dr. Abha Singh stressed that India has slipped down in Happiness Index and ranks 122nd out of 155 countries, four notches below its previous rank of 118 and behind its neighbors- Pakistan and China. Quoting the dismissal performance of Indian cities in Mercer 2017 Quality of Living Index, she called upon an urgent intervention by the Psychologists and Spiritual leaders to address the root cause of mental, physical and health issues in a totalitarian manner. She expressed her hope that the Seminar will have meaningful outcome for sustainable health and wellness. Delivering the key note address, Chief Guest Sh. Balvinder Kumar (IAS Retd. ), Former Secretary, Ministry of Mines, Government of India stressed that during last 4-5 decades, tremendous wealth has been generated by human beings and there has been remarkable progress in Science and Technology but despite of all this, much needs to be done in the area of mind. Outlining the weaknesses of human beings, he stated that human beings are extremely ignorant about their mind and its inner working. They perpetually suffer from a feeling of powerlessness which rises from ignorance. He remarked that human beings are not able to control their minds and are leading materialistic lives, thinking that material is the ultimate reality. He averred that human beings need to explore their minds, take inner journey, re-connect with the spiritual nature and realize that they are the architect of their own lives. He advised students to practice ancient wisdom, meditate and undertake other spiritual exercises in order to check mind from meaningless pursuits which will ensure peaceful existence of being. Expressing his views, Dr. I.V Basavaraddi, Director, Morarji Desai Institute of Yoga, Ministry of Ayush, Government of India shared that sometimes to get happiness, one accumulates stress and anxiety. Now- a- days, different forms of Yoga are practiced to achieve peace and happiness within but spirituality is the essence of Yoga and Yoga is essential to be spiritual. He remarked that Yoga brings harmony in life and helps to understand the basic essence of life. He announced that very soon, Morarji Desai Institute of Yoga will sign a MoU with Amity University to establish joint Centre at Amity which will not only promote Yoga training and therapy but also research in Yoga. While sharing his views, Prof. Jitendra Mohan, Prof. Emeritus of Psychology, Punjab University stressed that a chunk of the stress that human beings feel today are self-inflicted, which could be kept at bay with the help of mindfulness which is an art perfected in the East and re-imported from the West. Sharing his views further, he stated that health is not the result of absent pathogens (viruses, bacteria) or the absence of psychological stress or conflicts, but the ability of the body to control those pathogenic factors sufficiently. He remarked that illness and health are not states but dynamic processes and health has to be created at every moment in life. He called upon the gathering to forgive themselves for mistakes, sins, failures and past embarrassments and then permanently bury all negative self remembrances to lead a healthy life. Dr. Binny Sareen, Regional Director ,Global Hospital and Research Centre, Mount Abu stressed that India is the spiritual lighthouse of others and all Indians are spiritual beings Psychology and Spirituality are the need of the hour and highlighted how Global Hospital and Research Centre has treated more than 6, 000 heart patients through Yoga, Meditation, lifestyle changes and vegetarian diet. She remarked that health is all about restoring the soundness of mind, body and soul and being healthy means “heal thyself”. She called upon the gathering to stop worrying about things in life and keep smiling since when an individual smiles, over 75 trillion cells of the mind get energy and filling the person with limitless energy to connect the higher being. Also present during the inauguration were Prof. (Dr.) Balvinder Shukla, Vice Chancellor, Amity University and Dr. W Selvamurthy- President, Amity Science Technology and Innovation Foundation. The inauguration was followed by Plenary Session on “Integrative Approach for Holistic Health” by Dr. M.V. Bhole, Former Joint Director of Research, Lonavala, Dr.Madan Mohan, Professor and Head of Physiology and Yoga Research, JIPMER, Puducherry and Prof.Meena Sehgal, Professor and Chairperson, Department of Psychology, Panjab University ,Chandigarh.